London Clinic (income £137m) The independent charitable hospital paid its highest earner between £850,000 and £860,000. The clinic declines to name the person but its accounts say the figure related to contractual payments in lieu of notice. Nuffield Health (income £662m) The healthcare charity paid one unnamed person between £770,000 and £780,000. The figure included redundancy. David Mobbs, group chief executive, was its second-highest earner, receiving between £640,000 and £650,000. St Andrew's Healthcare (income £189m) The specialist mental healthcare provider paid its former chief executive, Philip Sugarman, between £750,000 and £760,000 in 2014, the year he left. This figure included pay in lieu of notice and compensation for loss of office. Wellcome Trust (income £281m) The science and medical foundation paid Danny Truell, its chief investment officer, between £590,000 and £600,000 a year. Royal Opera House (income £114m) The ROH's music director, Sir Antonio Pappano, received payments totalling £566,000. A note in the charity's accounts says that this figure included a salary and separate fees for conducting. Anchor Trust (income £268m) Jane Ashcroft, chief executive of the housing provider, was paid between £420,000 and £430,000 a year. This included a pension payment of £87,945, reflecting the fact she moved from a defined-benefit to a defined-contribution pension. City & Guilds (income £114m) The qualifications-awarding body paid between £400,000 and £410,000 to Chris Jones, its director-general. The charity says the figure included a base salary of £250,000, a performance-related bonus and benefits in kind. Legal Education Foundation (income £149m) It paid between £360,000 and £370,000 to Alan Humphreys, who was deputy chief of its predecessor, the College of Law and then acting chief of the entity established in 2013. The new chief is paid £150,000. Children's Investment Fund Foundation (income £100m) The foundation's highest earner received between £350,000 and £360,000 a year, but it declines to name the person. It says that its chief executive, Michael Anderson, earns £275,000 a year. Church Commissioners for England (income £140m) The charity manages the Church of England's land and investment portfolio. It paid its unnamed highest earner £330,000 to £340,000, which included a long-term performance payment of £91,000. The pay of senior charity staff has been under fire in the past few years, particularly from some Conservative politicians and sections of the media. William Shawcross, chair of the Charity Commission, has said that "disproportionate" salaries could bring charities into disrepute, and a report by the National Council for Voluntary Organisations has urged charities to be more open about pay levels and how they are set. Against this background, Third Sector looked two years ago at the annual accounts of the top 150 charities by income and created a list of the 100 charities that paid their senior executives the most. The results ranged from a charitable independent hospital that paid its highest earner nearly £1m to more mainstream large general charities and professional bodies paying between £120,000 and £130,000 a year. A repeat of the study this year reveals a similar pattern, with the highest pay to be found once again in charitable private hospitals and medical charities, philanthropic foundations, independent schools and professional bodies – charities that are often not recognised as such, do little public fundraising and have not attracted significant criticism. General household-name charities pay their highest-paid executives the least, yet have attracted the most criticism – perhaps because they are recognised as charities, with all the connotations of voluntarism the word entails, and have higher public fundraising and campaigning profiles. The median pay among general charities, which occupied 47 places in the top 100, fell from £155,000 in 2013 to £145,000 a year in 2015 – a decline of 6 per cent. Top place this year goes as before to the London Clinic, an independent charitable hospital in London's Harley Street, which awarded one unnamed senior executive between £850,000 and £860,000; a note in its accounts says the figure includes payments in lieu of notice. The hospital and fitness centre operator Nuffield Health was placed second again, paying one unnamed former executive between £770,000 and £780,000, including redundancy pay. Twelve of the top 100 charities paid their highest earners more than £300,000 and 32 more than £200,000. This compares with nine charities that paid their highest earners more than £300,000 and 30 that paid more than £200,000 in the 2013 study. Some charities that did not make it into the listing this year included Oxfam, Christian Aid and several other members of the Disasters Emergency Committee that were singled out for criticism by The Daily Telegraph in July 2013. These charities paid their highest earners less than £125,000 and therefore fell outside the top 100 (see "Methodology" with main table). Other household names with annual incomes of more than £100m, such as Sightsavers and the RSPB, also did not make the top 100. The overall mean average pay across the top 100 was £208,000 to £217,000, slightly higher than in 2013. The median pay level stayed the same at £165,000. But comparing how much charities pay can be problematic because of the way charities report remuneration. Some include pension costs, other benefits and redundancy payments in their figures, but others don't mention such benefits. The overall income of charities seems to have little bearing on the amount paid to the highest earners. For example, the housing provider the Anchor Trust had an income of £268m and paid between £420,000 and £430,000 to its chief executive, Jane Ashcroft, but Barnardo's, with a comparable income of £286m, paid £140,000 to £150,000 to its acting chief executive, Peter Brook. Instead, pay levels appeared to be more closely related to the sub-sectors in which the charities operated. 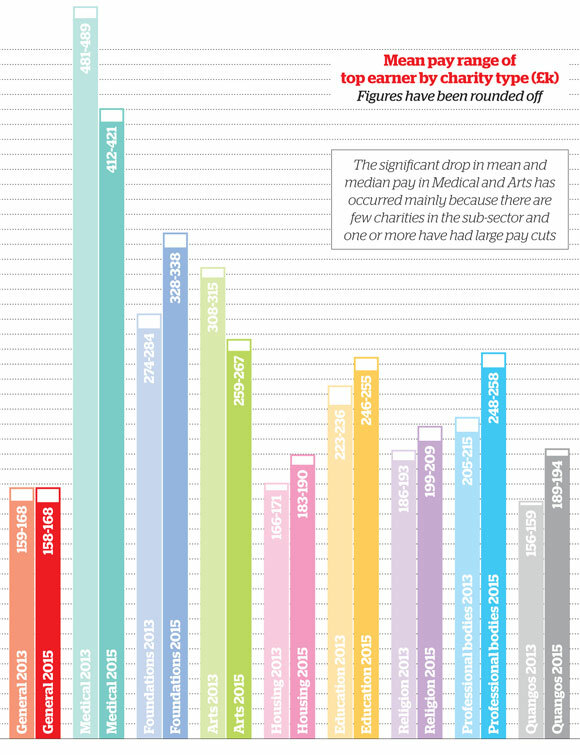 As in 2013, charities in the medical, health and science sectors were the most generous, paying their highest earners a mean of between £412,000 and £421,000 (a median of £232,000). General charities paid the least, with a mean of between £158,000 and £168,000, the same as in 2013. The study this year includes the total number of staff who were paid more than £60,000 in each organisation (see "Methodology" with main table). The British Council had the highest number earning more than £60,000 (286), followed by Cancer Research UK with 189. 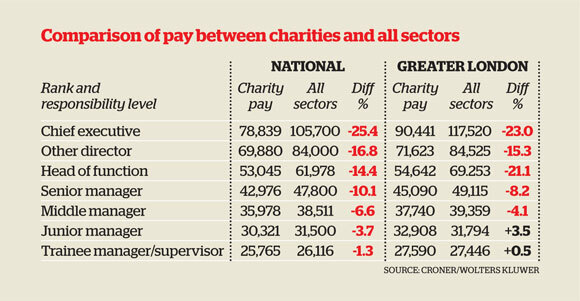 On average, the top 100 charities had 43 staff who earned more than £60,000. David Fielding, managing partner of the employment agency Attenti, which specialises in charity executive recruitment, says the study raises questions about what constitutes a charity. He points out that most members of the public wouldn't consider some of the highest-paying organisations, such as Nuffield Health or St Andrew's Healthcare, to be charities. He says most mainstream charities have exercised restraint in recent years, generally offering significantly smaller senior executive salaries than the private and public sectors. "For example, Richard Hawkes, the chief executive of Scope, runs a complicated organisation that has more than 3,500 staff and an income of more than £100m, and he earns £130,000 to £140,000," says Fielding. "In my opinion, his job is more complicated and comes with more risks than that of a senior civil servant, a university vice-chancellor or a chief executive of a local authority or a housing association, which pay a lot more." Many senior public sector roles come with less risk and better pensions and packages, he adds. Some critics of charity senior executive pay have called for the introduction of a pay cap, but Fielding believes that limiting charity pay would harm the sector. "Charities want dynamic, superb chief executives to drive and fulfil their missions," he says. "If you're too restrictive and sanctimonious on salaries, you will struggle to recruit and retain the best possible leaders." Gina Miller, a philanthropist who has been vocal in the pay debate, believes this argument to be spurious. She runs a foundation that has one employee, spent £8,300 on staff and made grants of £54,000 out of its income of £113,000 in 2013. "I don't buy the argument that these are rare people and you have to pay high amounts to get them," she says. "I think there are lots of talented, professional people out there who would do the job for more reasonable pay." 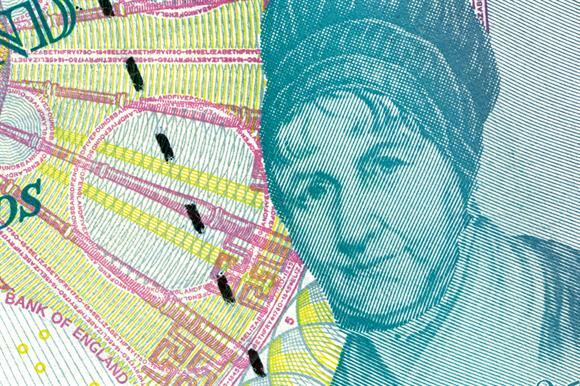 Miller believes that more charities should use remuneration ratios, relating the pay of the lowest-earning member of staff to that of the highest. "If you work backwards from the lowest-paid person, then you'd probably get a much fairer pay escalation ladder," she says. The use of ratios was among the recommendations of the NCVO's inquiry into senior executive pay at charities. Karl Wilding, its director of public policy, says the evidence it gathered suggested that charities tended to pay their lowest earners more than the private and public sectors did, and generally paid their highest earners less. The earnings data company Croner confirms that charities pay their highest earners about 25 per cent less than the total for all sectors (see the table "Comparison of pay between charities and all sectors", below ). "For a sector that gets accused of not living by its own values, the evidence doesn't quite fit," says Wilding. He says charities should take into account the NCVO's guidance when setting and reporting on senior executive pay, but adds: "It's not for the NCVO or anyone else to lecture charities about levels of pay. But it is for charities to explain how they arrive at decisions about remuneration." This table lists the 100 highest earners from the largest 150 charities by income in England and Wales, taken from the annual accounts on file at the Charity Commission on 19 January 2015. Some charities might have since filed more recent accounts. Universities were removed from the list this year because only some are required to file their accounts under charity law. The lowest income for the top 150 charities in this year’s study was £52m. In most cases, charities list the pay of their highest earners in salary bands of £10,000, but some state an actual figure. Some charities include pension payments, benefits and payments such as redundancy costs in their overall remuneration figures, but others do not state whether these costs are included. Six charities not in the top 100 also paid between £120,000 and £130,000, but these were excluded because they had higher incomes than those included in the table. Charities paying in a salary band between £120,000 and £130,000 were considered to be paying a higher amount than those that said they paid £125,000 or less. There might be some senior staff in charities with smaller incomes than the top 150 who are paid more than those in the table. 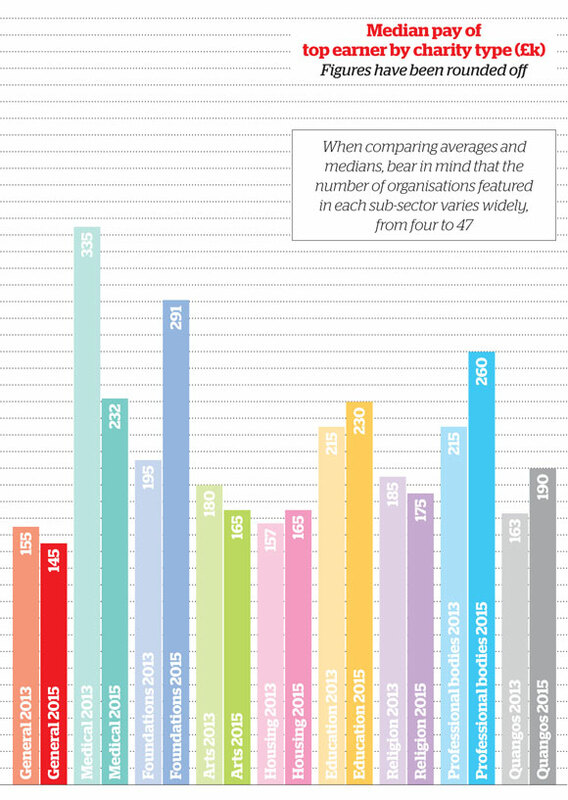 Corporates vs charities: how do they compare? The fashion retailer Asos has a turnover of £769m and pays its chief executive a total of £804,000, according to data from the remuneration advisory firm Patterson Associates. The charity Nuffield Health has comparable figures: its income is £662m and its highest-paid executive is in the £770,000-£780,000 pay band. Two other charities with executives paid in the £750,000-£860,000 range have much smaller incomes – St Andrew's Healthcare has £189m and the London Clinic £137m. The corporate services firm the Hogg Robinson Group has a turnover of £341m and pays its chief £594,000. Save the Children has almost the same turnover, but pays its chief between £130,000 and £140,000. Stanley Gibbons, the stamp collecting firm, has a turnover of £52m and pays its chief £397,000. Most charities with similar incomes pay less: Catch 22 and London Zoo have the same income as Stanley Gibbons and pay £120,000-£130,000 and £150,000-£160,000 respectively.